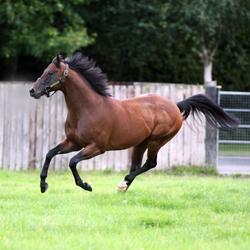 Eight Winner for First Season Sire Haatef. Derrinstown Stud’s First Season Sire Haatef recorded his eight individual winning 2yo when Lake Louise got the better of Versilia Gal and Sakhib (Haatef) back in third on the 16th of October at the Curragh. Lake Louise is out of the Bahhare mare Emmas Princess and was bred by Pier House Stud. Previous to this Haatefina scored for her owner Ushers Court, trainer Mark Usher and breeder Richard Tucker on the 18th of July 2012. Haatefina is out of the Caerleon mare Felona and was sold in the Doncaster St Ledger Festival Yearling Sale for £7,500. On the 14th of July Haatef’s previous winner Hasopop secured another win this time it was a conditions stakes race at Newmarket which he took in great style by 7 lengths. Bred by Brian Kennedy, Hasopop is out the Ela-Mana-Mou mare Convenience.